Play with the Queen of Hearts this Valentines day with this dramatic dark red, cream and black collection. Chevron patterns, bold graphics and black lace make the statement that love rules! This sophisticated QUeen of Hearts printable set is full of beautiful accents to make your Valentines day special. - Instead of a greeting card this Valentines Day, write a personal little love note for your sweetie to make it a little extra special with the Queen of Hearts themed Pochette Love Notes. 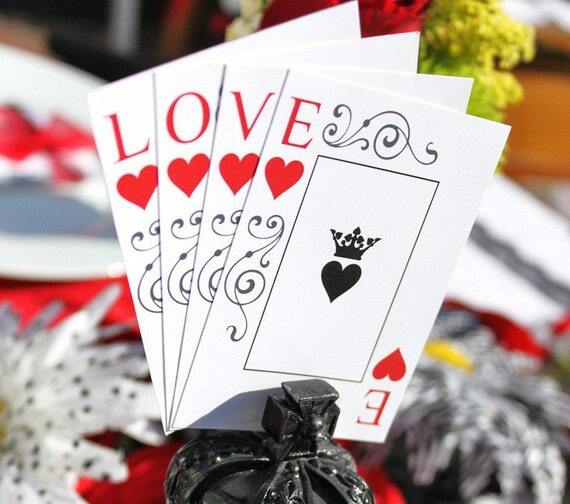 - Celebrate love with a Queen of Hearts themed "LOVE" pennant banner, with an additional queen of hearts graphic panels. - Accent your seating with Queen of Heart paper cones, or fill them with candy and goodies for a gift! The files are formatted to print on 8.5x11 white cardstock. You’ll need a printer (yours or the nearest office supply store’s), a sharp pair of scissors or paper cutter. Matching invitations and address wraps are available in a separate listing! Thanks to Celebrations at Home (http://www.celebrationsathomeblog.com/) for the beautiful product photography and styling.